Monday through Friday, 9:00 A.M.–5:00 P.M. unless otherwise notified. Our office is closed any time the New York Stock Exchange is closed. The New York Stock Exchange (NYSE) is open Monday through Friday, 9:30 AM. to 4:00 P.M. ET; however, it closes for official U.S. holidays or in the event of a major disruption. Most U.S. exchanges follow the NYSE’s schedule. 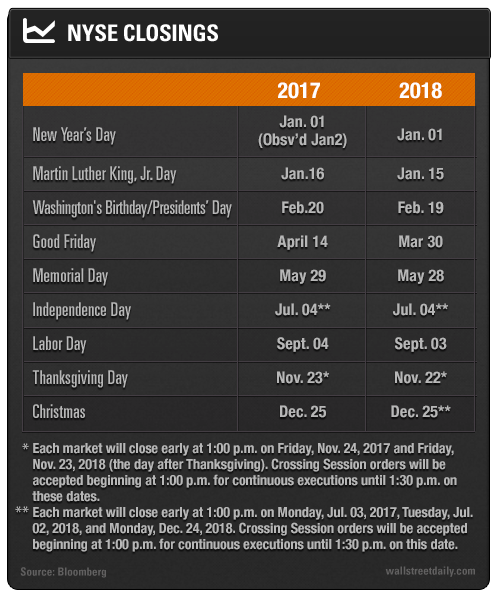 Below is a complete schedule of NYSE holiday closings for 2017–2018.